Winder Rewinder for Inkjet Printer, Mechanical 1.5 / 2.5 Kg. Optional Magnetic powder brake with tension controller & Torque control potentiometer. 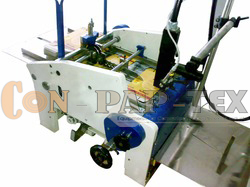 Provision for incorporating Ink Jet Printing System with Hot air ink drying. Max. Max. Parent Reel Dia 400 mm. Max. Rewind reel dia. 400 mm.